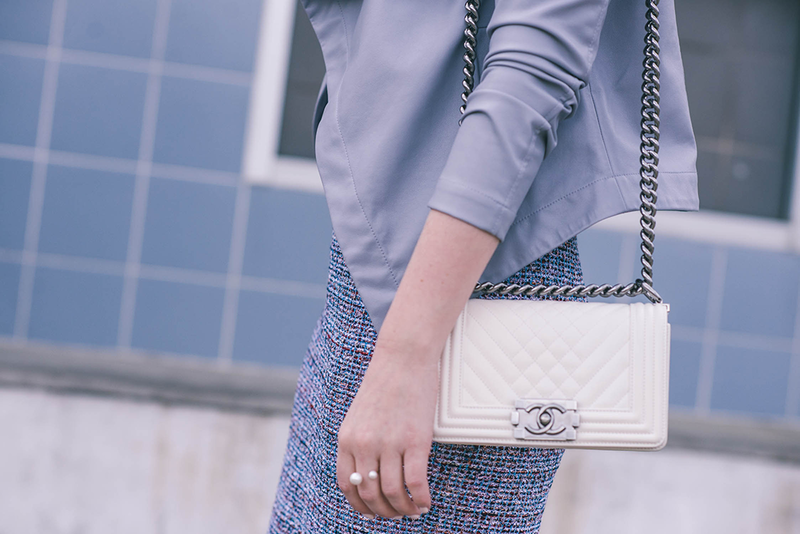 An item on my dream wardrobe wish list is a classic, Chanel tweed jacket. They are somewhat hard to come by, not to mention crazy expensive. Since I don’t see myself picking one up anytime soon, I’m always on the lookout for similar tweed pieces that will stand the test of time. Did I mention I love tweed? There’s something so sophisticated and refined about this luxe, textured fabric. It’s obviously an appropriate choice for the office, but I love pairing it with more casual pieces in my closet to give it a bit of edge too. It’s versatility is also shown in how it works throughout the year – heavier tweed jackets look so glam and polished in the fall and winter with leather leggings and jeans, and tweed skirts (love this one) and shorts look adorable with tanks and silk blouses come spring/summer. If you’re as big a fan of tweed as I am, you need to check out St. John’s collection for spring! SO many gorgeous styles… A few you can’t miss? This confetti pencil skirt (love all the colors – so many styling possibilities! ), this creamy ivory dress (heaven! ), and this boucle tweed fringe jacket. On the non-tweed side of things, I’m obsessed with this zig-zag knit dress, this stunning crepe gown, and this electric pink fit-and-flare frock. Stunning outfit, you look gorgeous in pastel colors. Adore this look: the color, the mix of textures & styles – just perfect!! Have a great day! I LOVE the muted hues! That skirt looks amazing paired with that jacket. Love your style! Perfect light outfit for Spring! Loving the tweed jacket you linked to too! This color palette is perfection! I love the shade of those heels! Gorgeous! Such a pretty Spring palette! That tweed pencil skirt is beyond gorgeous!! So timeless and elegant and I love it’s versatility. Such a feminine and flattering look! pinned! ah, love this so much, Merritt! The colors, the tweed, those heels, that jacket. The pieces are so good, and you styled it perfectly. Love this light, refreshing outfit. Wow! I love this look. The skirt is beautiful and it looks amazing with the jacket and your beautiful boy bag. Just perfect! The jacket, the skirt, the heels…. love this entire outfit and the color palette is perfect! You look very sophisticated…and I agree tweed does it. Those LR pumps are perfect with the confetti skirt. 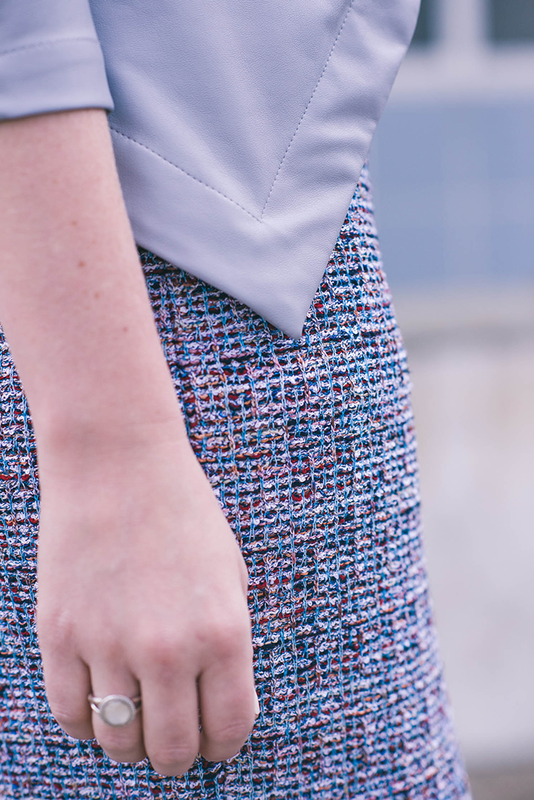 Such a gorgeous tweed skirt! Love how you styled it, very chic! Great look – that skirt is gorgeous! GIRL YOU LOOK BEAUTIFUL ! LOVING THE SPRING TWEEK AND THOSE BLOCKISH HEELS ! loving the colors in this look. so springy and feminine! This is the perfect spring tweed and I’ve been coveting this jacket lately! That skirt is divine. Still loving those sunnies! Such a fabulous skirt! You look gorgeous! Gorgeous outfit! Such a classic look! Gorgeous! I love the spring colors! I am obsessed with those sunglasses!